The decision has been taken for the magazine to be closed and all the staff laid off because of the distasteful cartoon. 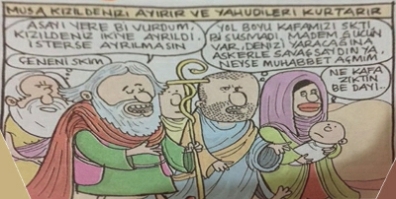 Girgir had published in its latest edition a cartoon showing the bearded Moses leading the Israelites out of Egypt, with his companions complaining and using strong language. Presumably for reasons of censorship and political correctness, the cartoon remains untranslated. The publishers blamed the cartoon on a deliberate attempt to put the company in a difficult situation, and said it would inform prosecutors of which employees were behind it. This has nothing to do with freedom of speech or humor. This is immoral and a hate crime. A bill allowing Israeli courts to force social media companies to remove content defined as incitement has passed its first reading in parliament. The Facebook bill sponsored by ministers Gilad Erdan and Ayelet Shaked would allow Israeli courts to immediately order content taken down if it is deemed to pose a public, personal or state security risk and constitutes a criminal offense. Facebook adheres to its own removal policy when it comes to online content and freedom of speech issues and has generally not removed as much as state censors would like. Tehilla Shwartz Altshuler of the Israel Democracy Institute has criticized the Facebook bill as too broad. She commented that the bill will not solve the problem and will hurt freedom of expression for all. Iran has blocked the popular Clash of Clans mobile game app. Government internet censors called for restrictions citing a report from psychologists, who said it encouraged violence and tribal conflict. The censors claim that the app could also negatively affect family life if teenagers got addicted to the game. In a statement, Iran's deputy attorney general Dr Abdolsamad Khoramabadi said the vast majority of the committee backed the call to limit who could play the app. Some Iran-based players said local reports had suggested that an age limit would be imposed, but for now the game is blocked for everybody, (bar those using VPNs and the like).